3. The Pillsbury rolls should naturally unwrap into a set of 4 squares (or rectangles – whatever.) Lay them out on the cookie sheet. 4. Lay 2 strips of bacon on each square. I cooked the bacon first, but the original recipe didn’t specify if that was necessary. If anyone knows that bacon can adequately cook after being baked in the oven, please let me know, as it will save a step for next time! Plus, I hate cooking bacon. 5. Crack a single egg over each square. THIS was the extra messy part. Try to keep the egg centered and not on a bumpy bacon-y part. It’s okay for the liquid to run all over the place, onto and in between other rectangles, but the yolk should stay on the dough. 6. Sprinkle cheese of your choice (I used shredded 4-cheese Mexican because that’s all I had). Be generous, if you love cheese like me! 🙂 Next time, I will be adding crumbled feta. 7. Tear up basil leaves and sprinkle (or strategically place.) Top with some cracked pepper. 8. Bake for 18-20 minutes, or until “pizza” is golden brown. I feel like this is the type of thing where you can customize however you’d like. I bet it would also be delicious with avocados, for instance, or tomato, not to mention any combination of herbs or cheeses. I think next time I will also add olive oil for a tad more moisture. Some parts were a little dry for me! 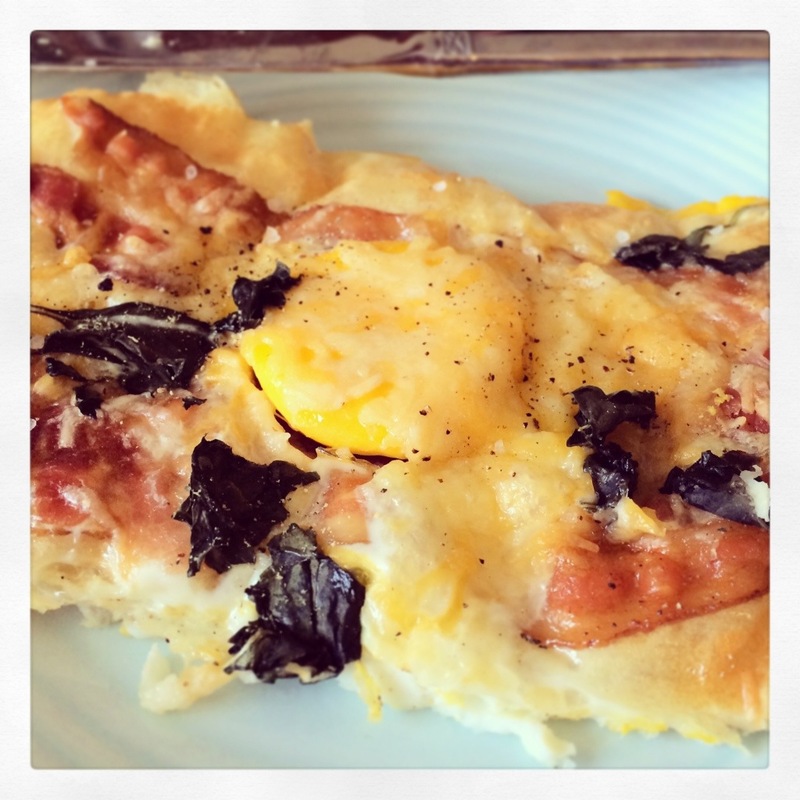 This entry was posted in Culinary Delights and tagged bacon, breakfast, eggs, food, pizza, recipe. Bookmark the permalink.